One year after sweeping new credit card reform rules were signed into law, credit card rates for new consumer accounts hit their highest level since IndexCreditCards.com began tracking them in late 2005. The average rate for the overall consumer credit card market rose to 16.81%, a sliver above the 16.80% record set at the end of March 2010 and 0.07% higher than our survey two weeks ago. Although troubling, the news isn't that surprising. Card issuers have been ratcheting up rates in the last year, and new survey results by FICO released this month indicate they remain pessimistic. The survey, conducted on behalf of FICO by the Professional Risk Managers' International Association in March 2010, asked bank risk professionals for their predictions in consumer credit trends. More than 85% said they expected the Credit CARD Act to result in higher interest rates and lower credit limits for new credit card accounts. They also predicted credit will remain tight as card issuers deal with the tougher regulations and attempt to regain profitability. The new regulations went into effect in August 2009 and February of this year. Among other things, they ban credit card companies from increasing interest rates on current balances unless cardholders are more than 60 days late on payments. They also restrict card issuers from hiking rates on new purchases in the first year an account is opened. After that, credit card companies must give consumers 45 days' notice for rate hikes and a chance to opt out of the accounts. Last year, our survey showed overall consumer rates broke the 15% barrier in September, the first time they had risen to that level in two years. Then in early December, for the first time since IndexCreditCards.com began publishing the Credit Card Monitor, the average overall consumer rate topped 16%. Rates have been creeping up ever since, except for a few tiny dips in the last few months. Since the May 15 Credit Card Monitor, rates rose in almost every category. The average rate for non-rewards consumer cards increased to 15.43% from 15.36%, and the average rate for reward credit cards increased to 17.39% from 17.33%. The average rate for student credit cards, meanwhile, jumped to 16.38% from 16.27%. 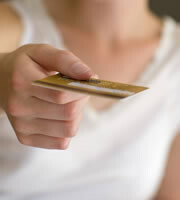 Many credit card offers feature tiered rates according to consumers' credit ratings. Those with excellent credit scores get the lowest rates, while consumers with poor credit are offered the highest rates. To determine a single "average" rate, IndexCreditCards.com includes all the various rate tiers that card issuers offer. Some rate tiers vary by as much as 10 percentage points for the same credit cards. Consumers with excellent credit scores now can get rates 4 to 5 percentage points lower than the overall market average. The average consumer rate for excellent credit is 10.86% for non-rewards cards and 12.72% for rewards cards. Business credit card rates remained the same since our mid-May survey, although they too have risen in the last several months. The average rate for non-reward business credit cards was 13.39% six months ago, compared to today's 13.75%, and the average rate for rewards cards for small-business owners was 14.53%, compared to today's 15.74%. Financial institutions represented in the survey include American Express, Bank of America credit cards, Capital One, Chase, Citi, Discover, HSBC, PNC/National City, Iberia Bank, Simmons National Bank, U.S. Bank, Wells Fargo, and more. 0 Responses to "Credit Card Rates Hit New High"